Is your gut a battlefield? No matter what your challenge is, know THIS: You CAN live a pain-free, energetic, happy life. You just purchase our 10-Day Bundle (at a discount!) And the Program is FREE. Session Starts February 4th! Reserve Your Spot NOW! 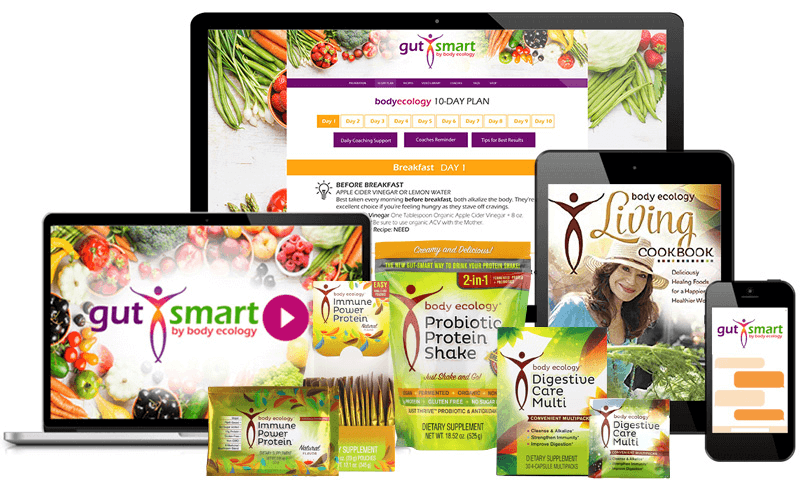 The Gut Smart Bundle is a combination of powerful probiotic shakes and supplements. 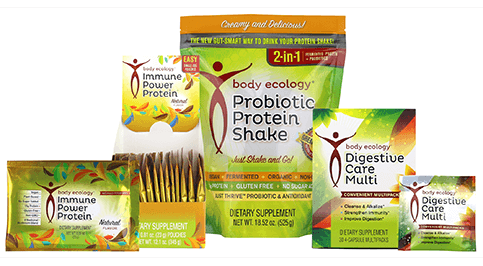 1) Body Ecology’s Probiotic Protein Shake with plant-based fermented proteins to help reverse leaky gut. It’s made with bacillus spores, so it’s a super probiotic – and all-vegan algae trace minerals and whole algal lipids — a powerhouse of thyroid supporting sea minerals and recovery-promoting essential fatty acids. 2) Immune Power Protein is loaded with a detoxifying organic medicinal mushroom blend to reinforce your gut barrier and feed your inner ecosystem (and support healthy weight, with powerful blood-sugar balancing benefits). 3) Digestive Care Multi to cleanse, alkalize, strengthen immunity and improve digestion. This is your digestive superhero, with a digestive enzyme power blend, a liver power cleanse, bifidus probiotic power blend, and ancient earth minerals/ocean plant extract. 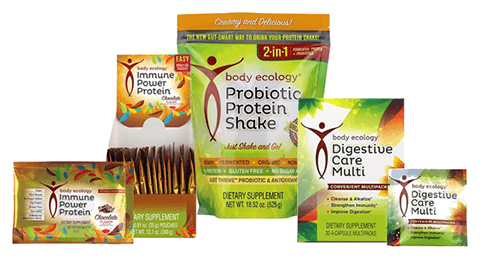 This powerful Body Ecology bundle along with your daily meal plan will support a fast track to better gut health In 10 days. 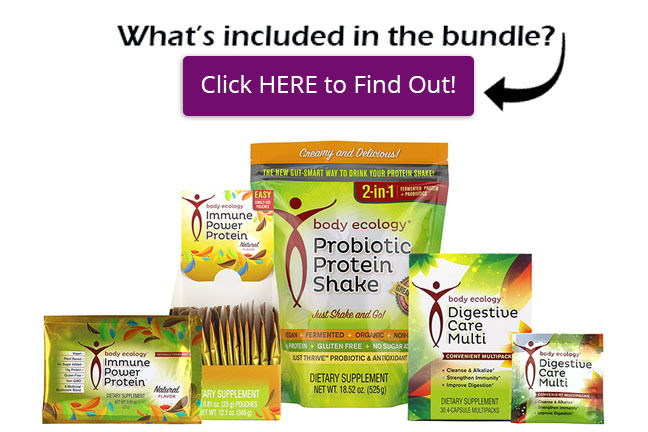 The Nutritional Bundle for the Body Ecology 10-Day Gut Reset Program comes in 2 flavor choices. Simply select your choice below to register for the course. 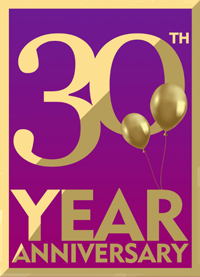 Donna Gates, one of the pioneers in nutrition & health, invites you to celebrate her 30th anniversary... By joining our 10-day Gut-Smart Challenge. Because the GUT is the GATEWAY to health. Or maybe you just want to improve your health and age beautifully. And, if you're anything like our test group, you'll lose weight, improve the appearance of your skin, and feel a whole lot better! In just 10 days, you’ll get a crash course on how to fast track your gut health. Your journey to ultimate health and well-being starts NOW. This 10-day program utilizes Body Ecology's world-renowned gut-balancing techniques, and several strains of the most potent probiotics on the market, to reset your gut microbiome for lasting change -- the key to healthy living, anti-aging, disease prevention, weight loss, and more! Each day includes a daily menu, videos, and coaching tips for success. Our Body Ecology Coaching Team will support you every step of the way with live coaching sessions during prep week and daily live sessions during the 10-day makeover. Have a question? You can ask during live Facebook sessions or email your questions starting February 4th, when prep week begins. Complete 10-day meal plan including recipes, shopping guides, and planning calendar. Specially formulated and powerful shakes and supplements to support your gut health and are the foundation of the 10-Day Gut Smart Makeover. Dozens of videos from your Body Ecology Elite Coaching team sharing tips for success, guiding you through the 10-day program. 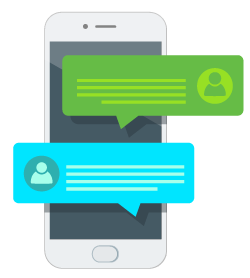 As well as answers to frequently asked questions to help troubleshoot common struggles and hurdles. Enjoy Donna Gates best-selling cookbook as a BONUS! 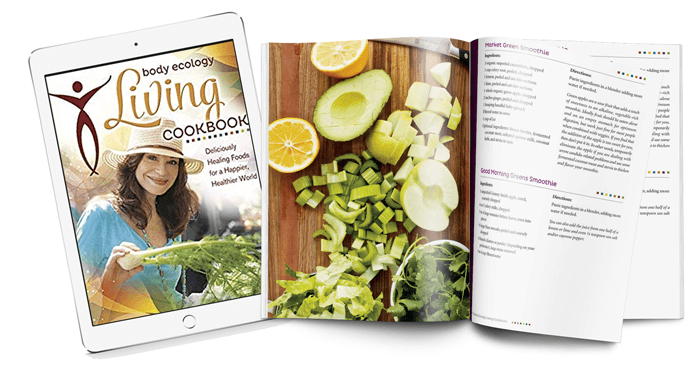 With over 100 recipes, Donna shares how to eat your way to better health. Handouts to support your journey including “Understanding Good Fats & Oils”, “Body Ecology Secrets to Success”, “How to Shop Menu Reset Guide” and more. Dozens of the most important and frequently asked questions answered to ensure optimal success on the 10-Day Makeover Plan. Where do you get cultured veggies? Can you snack during the Challenge? How can you listen to your body? 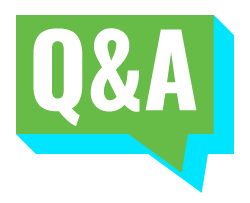 Plus many more Q & As that will ensure you get the most out of the Challenge. 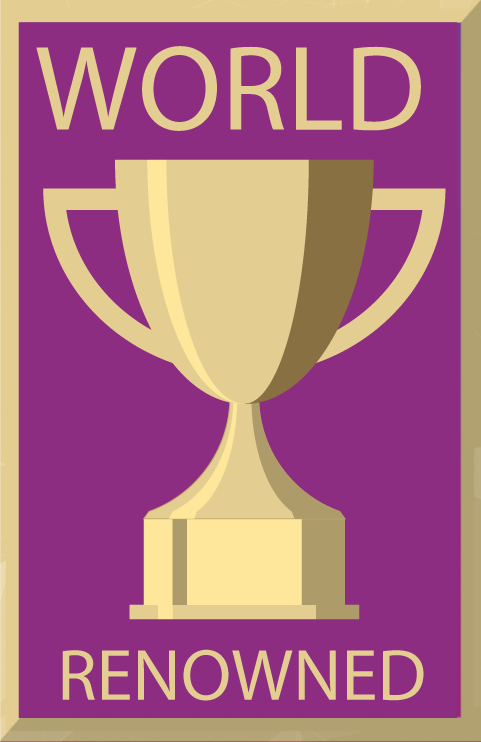 Daily motivational facebook posts and emails to keep you inspired and provide a step-by-step plan to reach your goals. Your journey to ultimate health and well-being starts now. Click below to say YES and join us! I was part of the beta test group for the Body Ecology 10-day Gut Smart Makeover. Initially going in, I thought I ate healthy. This 10-Day program really changed my understanding of what healthy is. I felt great and learned what good digestion feels like. My skin was/is now clear and bright. My cravings for bad foods stopped after just a few days on the program. I really changed how I look at food and what I put into my body. I love the Probiotic Protein shake and digestive enzymes and keep them stocked at all times. 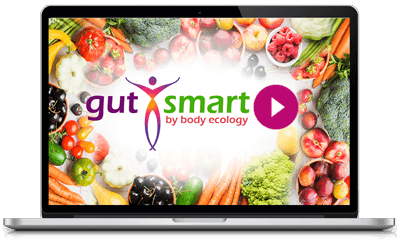 I recommend the Body Ecology 10-Day Gut Smart Makeover to anyone who wants to change the way they eat, lose weight or just live a healthy lifestyle. On day 10, I feel really good, I feel like I have a lot more energy, my skin today seems really soft. I think I’m going to keep going. I’ve lost over 10 pounds in these 10 days, but more importantly, I just feel better and I’m afraid that if I start putting sugar or dairy or anything of that back into my body, I’m just going to crave it more and go back down the rabbit hole, so I’m going to keep going as best as I can, and as much as I can, I’m not going to be too strict but I think this is pretty easy to follow. My boyfriend has been watching me do this and he thinks he’s going to join me, so that’s great, he really needs it, and I think I showed him that he can eat everything he’s eating now except for the grains and the dairy, but I’m going to try getting him on ripple milk and see if he likes that, we’re just going to test and see what he likes, so I’m super excited about that, but I really feel great so I just don’t want to do something that’s not going to make me feel the way that I feel right now. I feel great. I’ve lost about 7 pounds over these 10 days, which is awesome, probably a lot of inflammation kind of weight, I’m assuming, I plan to keep going, and continuing on, and using up all of my shake ingredients and Digestive Enzymes and eating well. – Celeste E..
Michelle B. Says: “I can’t believe my energy level, and my skin looks fantastic. Donna Gates, M.Ed., ABAAHP, is the international best-selling author of The Body Ecology Diet: Recovering Your Health and Rebuilding Your Immunity, The Body Ecology Guide to Growing Younger: Anti-Aging Wisdom for Every Generation, and Stevia: Cooking with Nature’s Calorie-Free Sweetener. An Advanced Fellow with the American Academy of Anti-Aging Medicine, she is on a mission to change the way the world eats. Over the past 25 years, Donna has become one of the most respected authorities in the field of digestive health, diet, and nutrition. 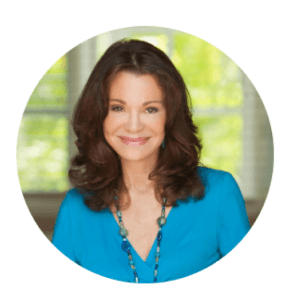 A recognized radio host of The Body Ecology Hour with Donna Gates on Hay House radio, Donna regularly contributes to The Huffington Post and The Daily Love, and lectures at the “I Can Do It!” Conference, The Longevity Now Conference, and Women’s Wellness Conference.